← Marisa Checking Our Bees! With a couple of cows giving more milk than we need right now we have been making butter every couple of days and a four gallon pot of mozzarella cheese every day. We use the skimmed milk for the mozzarella, shred, date and packaging it for out-door pizza oven bakes this spring and summer. Put a quart of heavy cream, that has aged in the fridge for at least several days, into a blender. It should be around room temp so we pull our cream out in the morning. Next turn the blender on low for a bit sometimes switching back and forth from high to low. There is no set rule here. It takes approximately 5 minutes max. per batch. You can hear and see the difference when the butter comes to the top. Remove lid and skim out the butter chunks placing them into a bowl. Depending on how much cream we have we like to finish the entire batch before washing the butter. Now the butter is ready to wash until the very cold tap water runs clear. We put the bowl in the sink so that we can keep adding cold fresh water constantly. You can do this by beating the butter using a wooden spoon, fork or your very clean hands. Try to get all the water out. We have a homemade wooden butter block to use as our mold. Our family likes our butter salted so we salt the butter right near the end when the butter is washed and most of the moisture is out. We tip the butter out and then wrap it in Saran wrap marked with the date. The butter stores well in the freezer and never really gets old since we use a lot of butter daily. This is so easy that my 13-year-old Maggie has taken over the job. If you don’t have a mold you can just as easily wrap nice sized balls of butter in wrap. This butter tastes delicious. Save the buttermilk for the whole wheat pancake recipe or buttermilk biscuits. There are so many uses for buttermilk in a variety of recipes. Last night we were out of sour cream and living so far from the store we often have to make do with what is here. Frenchy was over making a special meal for the Feast Day of St. Joseph. She used the freshly made buttermilk in place of the sour cream and the comments from the family were only that the meal was excellent. It must have worked. If my method is confusing google up a method that works for you. There are many available. 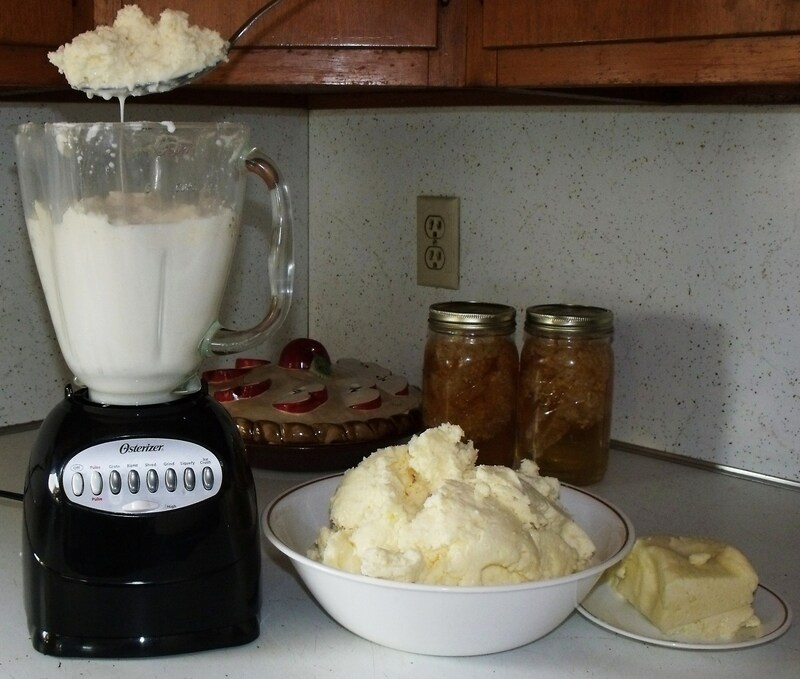 This entry was posted in FARM KITCHEN and tagged butter making in a blender. Bookmark the permalink.